If we are to ever find success as African ancestored people we will need to set aside our differences for the greater good. We will need to also be trustworthy and to be able to trust those who lead. Children of the African Diaspora in America can especially site examples of leaders who began their missions with the best interests of their people as the primary motivation. After they became seasoned and developed a following, their motivations changed and they betrayed the trust bestowed upon them. Sometimes those who have earned the close association and trust of the leader fall victim to outside factions and are tempted by monetary offerings, status, or recognition. I site an age old story of Judas, a friend and follower of Christ who came to know the pain of regret after he realized he was just a pawn in a plan designed to eliminate a leader. “Then entered Satan into Judas surnamed Iscariot, being of the number of the twelve. And he went his way, and communed with the chief priests and captains, how he might betray him unto them. And they were glad, and covenanted to give him money. And he promised, and sought opportunity to betray him unto them in the absence of the multitude.” (Luke 22: 3-6). “And while he yet spake, behold a multitude, and he that was called Judas, one of the twelve, went before them, and drew near unto Jesus to kiss him. 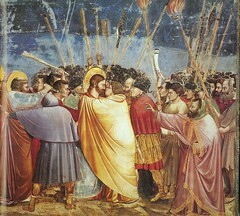 But Jesus said unto him, Judas, betrayest thou the Son of man with a kiss?” (Luke 22: 47-48). The children of the African Diaspora in America know all too well the pain of hope crushed by leaders who betray them. Before we embrace a leader, we need to examine the trustworthiness. We need to hold them accountable because there will always be the temptation to go astray. Outside forces are designed to pit us against each other, and we find ourselves torn between two debating leaders. The change that we seek requires a dialog within our various communities. That dialog will inspire action. We have failed even before we start if we cannot trust each other, but good followers silently working behind the scenes can somehow bring about more change than a trusted leader.